ThePhotoBoothDirectory.com is the original and OFFICIAL online directory to help you locate and choose from a wide range of photo booth vendors, servicing your area. Most photo booth operators can provide their services for any event type. But ask first, if you're not sure. Always ask quesitons. Photo Booths are so popular today, they are seen at most events today. 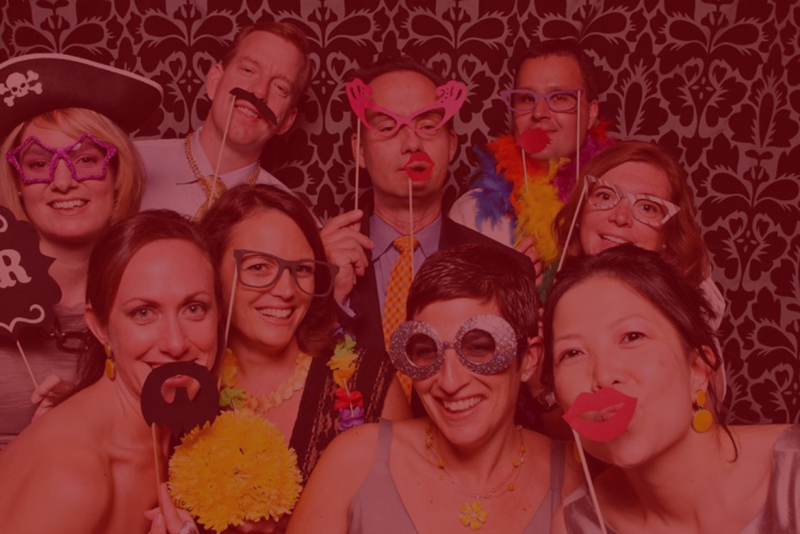 It's now common to see a photo booth at a wedding event, birthday, or corporate/company event. No matter what the situation, photo booths are fun for anyone, all ages! Capture the fun times! Use the fun props to enhance your photos with friends and family. Most operators provide a 4x6 standard printout or the old fashion photo strip (2x6). Plus, you can now choose to digitall send that photo to any mobile device or post it on Facebook, Twitter, or Instagram. Ask your photo booth operator for these services when hiring them. Also, another fun feature is the Green Screen! Choose different back drops for your photo booth experience. Lastly, most photo booths allow video messaging and show motion videos. Send these to your mobile device directly from the booth! When hiring a phoot booth company, make sure they have the latest options so you can get the most out of your photo booth, It's not jsut for taking photos anymore! Photo Booths are the MOST Popular mobile service today for ALL events. Everyone, all ages, LOVES taking photos and sharing them with their friends and family, either a printed photo or instantly online on social media. A photo booth is more than just taking a photo on your phone, it's an experience. Most companies provide all of the fun props (hats, glasses, boas, beads, etc), offer Green Screen, video messaging, slo-motion video, hashtag# printing, scoal media sharing, text/email, scrap books and much more. Here are five steps to help you hire a Photo Booth service for your next event. 1. Get an early start. When you hire Photo Booth service, start as early as possible, at least a two to three months prior to the actual event date. Most popular photo booth services get booked up quickly, especially during the busier season in your area, and most weekends. 2. Experience & Knowledge. An experienced operator, knowledge of the business, and good customer service are factors to consider when searching for a photo booth service for your event. Photo Booths are FUN... so you'll want to hire an experienced company and operator. 3. Ask for references. Ask for clients that your Photo Booth company has worked for, similar to the event you are having (Wedding, birthday, Mitzvah, Company event, etc). References can also include video clips or photos of some of their most recent events. 4. Do Your research. Photo Booths come in two types... Enclosed and open air style. Decide which type of photo booth you want and features as well. Not all companies offer all options or multiple styles of the photo booth. Typlically, a photo booth can range from $500 up to around $1,200. You don't have to choose the cheapest; simply choose the company that is best suited for your event and budget and satisfies your Photo booth needs. If you have time, go out and see some of the different photo booth services in action, at events. 5. Check out their website. Each photo booth business will have a website that displays many photos of their past events and exactly what their booth looks like. They should the included services for example... unlimited photos and printouts, props, set up and break down, etc. Ask questions! Did you know..... Photo Booths are the MOST popular service at weddings, birthdays, anniversaries, Bar/Bat Mitzvahs, and corporate/company events today??? Photo Booths were very popular in the 50s and 60s and never really caught on with on-location events until around 2010. Today, photo booths are basically a staple of every event today. Just like the DJ or band. Music and photos are a great mix of entertainment for all guests. Enjoy the variety of photo booths available today. To locate a professional operator in your local area, scroll up to the seach bar and search by your zip/postal code, city/province or state's name, or even a vendors business name, if oyu know it. Our seach database is the official Photo Booth vendor database online and we are the FIRST to lauch a directory for photo booth operators in the US and Canada. Smile! Getting Married? Need A Photo Booth? If you have any questions, feedback or any comments about ThePhotoBoothDirectory.com online directory service, we can be reached by contacting us here. We are happy to hear what you have to tell us.